Matt C: This film was on shaky ground from the very beginning. After an aborted attempt to create a misguided cinematic 'Spiderverse' with the two Amazing Spider-Man movies (at one stage there was plans to make a solo Aunt May flick), Sony seemed to come to their senses by agreeing to loan Spidey to the hugely successful Marvel Cinematic Universe, resulting in arguably the best take on the character yet, one who existed in a world where superhero team-ups are as regular as clockwork. Marvel Studios have repeatedly shown they know how to utilize their large roster of colourful heroes and villains, and Spider-Man now seems like he's in very safe hands. But Sony still had plans of their own, eager to monetize the library of related characters at their disposal, and rather than giving everything over to Marvel they seem intent to forge ahead with a retrofitted Spiderverse concept again, only now without Spider-Man himself (which even the casual observer must consider a peculiar decision). First out of the gate is Venom (with Morbius the Living Vampire, Black Cat and Silver Sable projects all in development), and again this seems a strange choice for a character whose comic book origins, history and, indeed, design are so intrinsically tied to the wallcrawler's. Venom is a divisive creation, beloved by many but with a possibly generational dislike in some quarters, as there are those who see him as emblematic of the worst excesses of '90s mainstream comics, where the prevalence of 'cool' and 'violent' characters paved the way to the speculator boom that nearly sank the entire industry. In Venom's second big screen appearance (following Sam Raimi's often maligned Spider-Man 3), he's blessed with a top tier cast (Hardy, Williams and Ahmed) and a director (Fleischer) who has talent but hasn't yet really delivered on the promise of the delightful horror-comedy Zombieland. It still has that one, seemingly insurmountable hurdle though: no Spider-Man. Taking Peter Parker out of the equation and giving hard-hitting reporter Eddie Brock (Hardy) the spotlight should have provided a reason to flesh out his character beyond the usual "Parker ruined my life!" shtick, but characterisation isn't a priority here; nor, for that matter, is logic or motivation. The boilerplate plot ticks all the boxes on its way to unleashing the monster, introducing the main players but then giving them very little to do outside of the basic expectations of the formula. In a way it feels like a throwback to the era before the MCU redefined the template - or even further back than that - to a time when most superpowered intellectual properties didn't have the credibility and respect they do now, and were treated like big budget cartoons that offered the opportunity for respected actors to ham it up wildly. That the three leads here - two Oscars nominess, one Emmy winner - are given so little to work with is a crying shame, as each of them has shown they've got the chops to really deliver something far above the average. Hardy obviously gets the most to do, but the script's tonal uncertainty - veering from body horror to misjudged comedy - does him no favours, and there are times when being infected by an alien parasite seems like nothing more than a mild inconvenience. 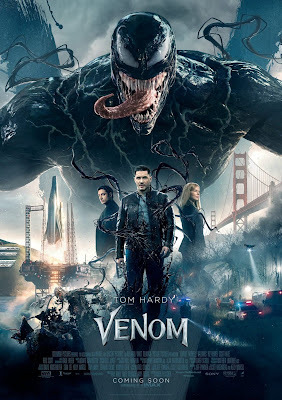 It gets more ludicrous as it goes along, with villainous plots lacking any sense and an overall feeling that the makers still couldn't figure out the right balance between anti-hero and homicidal monster even as they were shooting the movie. The action is serviceable at best but generally dull; noise and kinetic chaos reduced to a blur of colour and sound with no energy or discernable value. 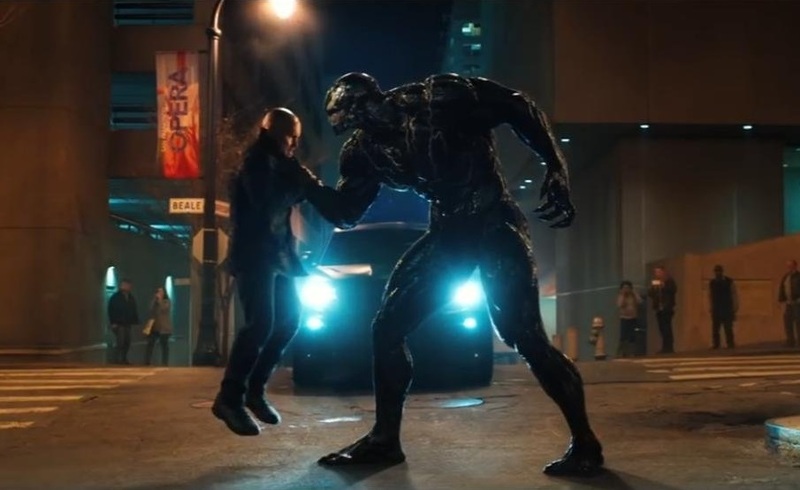 The worst crime is that it's lazy; Venom's remixed origin does nothing to make him more interesting, and bonding with Hardy sees him favour silliness when sinister should have been the vibe to go for. In more capable hands, there may have been potential, but the character has always been most effective as a villainous, unhinged mirror image of Spider-Man, and with no possibility of fulfilling the role of arch-nemesis, he has very little real purpose (biting people's heads off is simply not sufficient reason to give him his own movie).